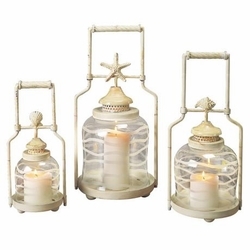 This charming set of three shell nested lanterns are made in the traditional style. The distressed white finish frames have a darling shell accent above the chimney. Each of this set of three shell nested lanterns have a different coastal shell motif. The center clear glass piece has a white wave design for added coastal style. Take time out to be alone with yourself, with your thoughts, with your fears, with your memories, with your dreams. Light a candle! • Small is 13" high, 6" wide and 4 3/4" deep. • Medium is 16 1/2" high, 8" wide and 6 1/2" deep. • Large is 19" high, 9 3/4" wide and 7 1/2" deep.